Open/Close Menu The Maori are the indigenous people of New Zealand having settled there hundreds of years ago after extremely dangerous sea journeys from eastern Polynesia. On the pages of this site you will find interesting facts about the Maori. This information includes who the Maori are, where they live, how they got to New Zealand, and when they arrived there. There is also information about their history and culture including their distinctive carvings and jewelry made primarily out of jade (greenstone) and bone. This information is written for both kids and adults. The first Maori settlers to New Zealand are believed to have arrived between 1250 AD and 1300 AD. They arrived over a period of several years in a series of voyages from eastern Polynesia made in huge canoes. Centuries of isolation from other cultures came to an end when European explorers discovered New Zealand and encountered the Maori. These explorers include Abel Tasman in 1642 and later Captain James Cook in 1769. Starting in the 1780s European sealers and whalers started arriving in New Zealand and interacting with the Maori. They were followed by others including missionaries and even escaped convicts. Contact with Europeans had devastating effects on the Maori; the Europeans brought diseases to New Zealand from which the Maori had no immunity. Wide spread epidemics wiped out a huge number of the population. Click here for more information about Maori history. After arriving in New Zealand, the Maori experienced centuries of isolation from other cultures resulting in their developing a unique culture. They developed a unique language, a distinctive mythology, and a unique art form which can be seen in their beautiful carvings. Warfare was very common among the early Maori; leading to the development of unique weapons. The Maori language is Te Reo; along with English it is an official language of New Zealand. The Maori have a distinct form of tattooing called Ta moko. Being tattooed was traditionally an event that marked the passage from childhood to adulthood; there were many rituals involved in this painful process. The Maori Haka Dance is a traditional vigorous group dance performed by the Maori which also usually involves a chant. Most Hakas are war dances and they are an important part of Maori culture. Maori jewelry is unique and beautiful and usually incorporates designs and symbols that have cultural significance to the Maori people. Maori jewelry includes jade carvings, bone carvings, and Paua Shell Jewelry. The Maori are famous for their beautiful and unique carvings. Maori carvings can be found on their houses, boats, statues, and jewelry. A Maori carving can be made from many different materials including jade, bone, silver, and wood. Some of the most common designs and themes are listed below. 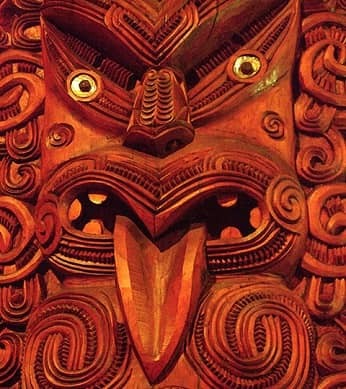 Click here for more information about Maori carving designs. In the Maori language the word Maori means "normal" or "ordinary". The Maori used this word to refer to themselves as a people; especially in comparison to the European settlers and explorers to New Zealand. The focal point of a Maori village is the marae. This is a meeting area that is usually situated in front of a communal meeting house. In this area the Maori conduct important events such as weddings, funerals, and celebrations. According to a census taken in 2013 598,605 people living in New Zealand identified themselves as belonging to the Maori ethnic group. This is approximately 15 percent of New Zealand's total population. When the first Maori arrived in New Zealand they encountered a huge flightless bird called the moa. These birds could reach heights of 12 feet (3.6 meters) tall. Around 1300 AD these birds became extinct; mostly due to hunting by the Maori.